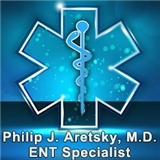 Dr. Philip J. Aretsky (Glen Rock) - Book Appointment Online! If you're looking for personalized care and the attention you deserve, then call Dr. Philip J. Aretsky for your next appointment. Dr. Aretsky has helped thousands of area residents enjoy great health and optimal hearing. Our facility offers a free parking lot and we are handicap accessible on the ground floor. Dr. Aretsky is brilliant, kind, sensitive, and caring. He's definitely NOT the kind of doctor to prescribe unnecessary treatment or tests. I recommend him enthusiastically.